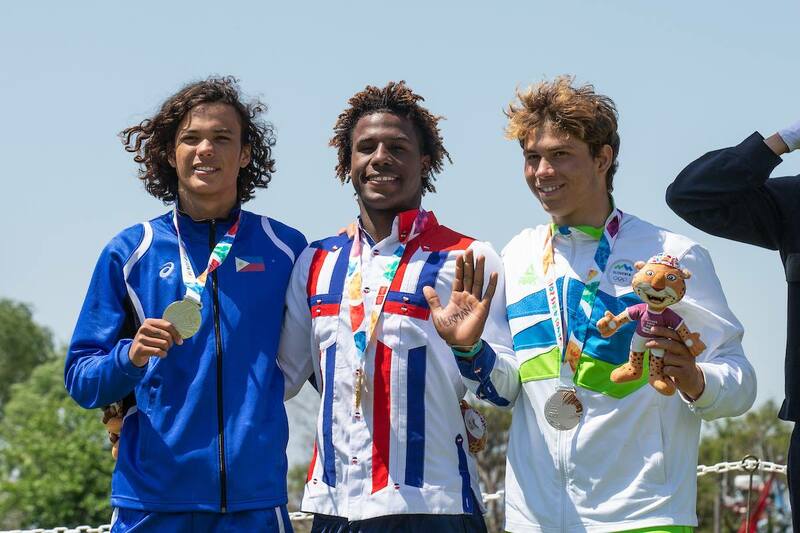 MANILA, PHILIPPINES – Seventeen-year-old Boracay native and Red Bull Athlete, Christian Tio, bagged the silver in men’s kiteboarding at the 2018 Summer Youth Olympic Games on Sunday, October 14th, 2018, in Buenos Aires, Argentina at Club Nautica San Isidro. This is the first medal gained by the Philippines in this year’s games. Tio shared the stage with fellow silver medalist, Slovenia’s Toni Vodisek, and gold medalist, Duery Corniel from the Dominican Republic. “I have mixed feelings. I am both really happy and proud to make it up to the podium with the Philippine flag,” shares Christian Tio. After emerging victorious at the Youth Olympics Qualifier this past March in Pranburi, Thailand, Christian Tio spent the last several months training all over the world. His training was overseen by Jay Ortiz, president of the Philippine Kiteboarding Association. Locally, Tio honed his craft at Manila’s Ninja Academy, an indoor parkour and conditioning facility. In the month prior to the Youth Olympic Games, Tio continued his training in the Dominican Republic and in Italy. The training prepared him to overcome the unfavorable weather conditions that plagued most of the games. Having spent his life immersed in the sport, Christian Tio began his career at the age of ten, when he competed at the KTA’s Asia Championship. The experience would lead him to compete across the world. Years later, he began his professional career as a fourteen-year-old after scoring second place at the Junior Kitesurfing World Championships. As a competitor in kitesurfing’s debut at the Youth Olympic Games, Christian Tio succeeded in his promise to represent the Philippines, while elevating the sport at an Olympic level. For updates on Christian Tio, follow www.facebook.com/christiantioboracay.